Wildoctric, a northern elephant seal, received groundbreaking hernia surgery during his stay at The Marine Mammal Center. Meet "Wildoctric" – an unusual name for an unusual patient, and one who needed help for a serious, hidden medical condition. This young female northern elephant seal was rescued on April 30, 2011, in the middle of the Center's rescue range, at Monterey State Beach. Wildoctric was extremely lethargic and suffering from severe malnutrition, weighing only 40 kilograms – pups this age should weigh at least 75 kilograms! The Center's rescue team responded quickly to a concerned citizen's call, rescued and delivered her to the waiting veterinary team back in Sausalito. During her admit-exam, the veterinary staff noticed that the young elephant seal already had a green flipper tag - indicating that she had been counted only a few weeks prior at the Año Nuevo State Reserve. 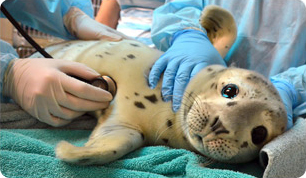 Within days, the team realized that this wayward pelagic pup was suffering from something internal. "She was a poor eater, managing only a couple of whole fish, so we prescribed supplemental tube-feeding, but still, she couldn't keep her food down, vomiting frequently," explained Dr. Rebecca Greene, one of the Center's associate veterinarians. "Despite our best efforts, she was not able to consistently gain and keep weight on," added Dr. Greene. Therefore, after nearly three weeks of erratic gains and losses, Dr. Bill Van Bonn, the Center's Director of Veterinary Science, decided it was time for some more in-depth investigations. "To my knowledge, this was the first time that anyone attempted these procedures on an elephant seal," explained Dr. Van Bonn. The team started by investigating the internal organs using a series of basic radiographs, or x-rays, which revealed some abdominal abnormalities. A few days later, the team conducted more detailed contrast-radiographs and a subsequent endoscopy revealed the underlying problem – a sliding hiatal hernia. These procedures are commonly performed on humans, where a tiny camera mounted at the end of a long thin tube is inserted through the mouth, down the esophagus, and into the stomach. "There was something inside the abdominal region that was herniating, or moving, into the chest cavity – and that "something" was her stomach!" explained Dr. Van Bonn. "So, we decided to perform a laparoscopic gastropexy to keep the stomach from moving into the thoracic cavity," added Dr. Van Bonn. On June 9, 2011, Wildoctric began an incredibly smooth recovery. Just hours after surgery, she accepted small amounts of prescribed whole fish, and was ready for more. Each day, her ration was carefully monitored and gradually adjusted upward. Originally, Wildoctric was admitted to the hospital at only 41 kilograms. But in just 20 days following the surgery, she had gained nearly 20 kilograms! Wildoctric was released on June 30, 2011, at Chimney Rock in the Point Reyes National Seashore, along with several other rehabilitated patients. On the day of her release, she weighed a healthy 61.5 kilograms! "Watching this marine mammal swimming and diving, and successfully retrieving whole fish on her own was a joy," said Deb Wickham, the Center's veterinary science operations manager. "Her treatment, rehabilitation and release outcome is what we all work for, each and every day!" added Wickham. TMMC volunteer Marjorie Boor keeps a close eye on a rare sliding hiatal hernia surgery performed on an elephant seal! High-definition cameras and monitors guide and record this ground-breaking procedure. Learn more about Northern Elephant Seals. Read about our Top Research Projects. See the depth of our work in our Scientific Publications. Open young eyes to a new world. Each year, 30,000 school children learn to appreciate marine mammals through our educational programs. Pick up where nature left off or where man interfered. Injured or malnourished marine mammals are nursed back to health by us then returned to the wild. Affirm the importance of ocean health. Marine mammals and humans eat from the same food chain; their health is directly related to ours. Bring new life to endangered species. Artemis, rescued by us as a pup, gives birth to a Steller sea lion of her own.